This spring, LA is blooming with more than just wildflowers – new galleries, interactive exhibitions, and immersive experiences are popping up like poppies all across the Southland. Discover dazzling VR and interactive installations at the world’s first fully immersive entertainment art park. Food meets art at Audrey restaurant, which recently opened at the Hammer Museum, while The Egg House features some “eggcellent” treats to view and eat. Animal lovers will revel in awww-worthy displays devoted to our furry friends. Whatever your culture club, LA’s new galleries and immersive exhibitions are guaranteed to inspire, amuse, and entertain! Recently opened this month, Brannon Mason Gallery is a new contemporary gallery for social impact situated in a 4,500 square foot commercial space in the LA Arts District. 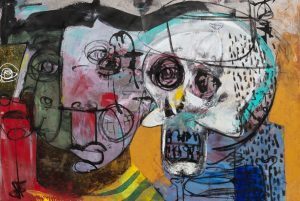 The inaugural exhibition, CORNERSTONE, presents the U.S. debut of French photographer Etienne Rougery-Herbaut and Haitian artist Samdi, showing new works from each artist, as well as an exuberant series of collaborations the two conceived specially for this occasion. The American Civil Liberties Union (ACLU) of Southern California is the benefiting organization of the first show, with donations supporting the Immigrants’ Rights Project. 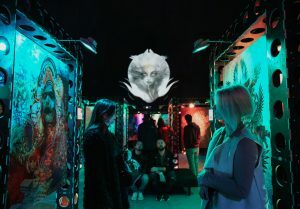 Wisdome.LA, the world’s first fully immersive entertainment art park, presents SAMSKARA, an immersive art exhibition featuring works from transformational artist Android Jones. Visitors will experience a full dome mapping projection show, microdose VR, interactive photo display, and Android Jones art gallery. Samskara is Sanskrit for the scope of experiences which we collect through our life journeys. Good samskara is driven by positive experiences and deeds, while negative samskara is the result of evil or selfish thoughts and actions. Wisdome.LA is dedicated to presenting avant-garde transformational experiences and unforgettable events in a unique multiple projection domes setup, featuring VR and 360 immersive audio and visual experiences. Located within the Hammer Museum in Westwood, Audrey restaurant blends elevated and soulful cooking with a contemporary Southern California feel rooted in the region’s growing seasons. From restaurateur Soa Davies Forrest and chef Lisa Giffen, the dishes emphasize European flavors and techniques complemented by a full bar offering fresh, bright cocktails and a diverse wine list showcasing small production winemakers. The modern and inclusive space designed by architect Michael Maltzan and interiors by Fettle Design features a prominent tile installation from renowned Cuban-American artist Jorge Pardo. 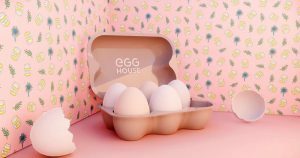 The Egg House is the first egg-themed pop-up space offering a multi-sensory experience, led by founder Biubiu Xu and an eggcellent team of creators, designers, and artists. With multiple rooms of immersive installations and interactive experiences, The Egg House is a house full of dreams and fantasies that saves you from the busy concrete city, and brings you a shareable fun time to spend with friends and family. Visitors can explore Instagrammable installations, interactive design, vendors with “eggcellent” egg treats, a gift shop and more. Bunnies aren’t just for Easter! 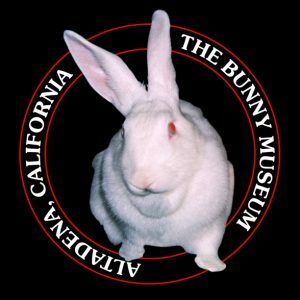 The Bunny Museum is a world record-holding museum dedicated to rabbits that opened to the public in 1998, Founded by Steve Lubanski and Candace Frazee, who as a couple are called Lubunnzee, The Bunny Museum tells the history of bunnies in advertising, art, entertainment, fashion, film, and everyday vernacular. Got dust bunnies in your home? Do you know what bunnies have to do with math? Have you ever heard of a rabbit plane? Have you ever eaten a Welsh Rabbit? Hop on over and find out. The Bunny Museum has 35,754 bunny objects to date. ALERT: This museum is not recommended for pre-school children. Children are welcome, but they are not the target audience. 100 Tactile is the first and only tactile interactive exhibition – featuring 100 boxes with unknown content inside! The audience will experience objects and symbols completely through the sense of touch, activating a different kind of awareness to the world. Complemented by supporting visual elements and music, the artwork consists of 100 individual pieces, divided into 3 sections: 1. Daily Objects 2. Materials and Texture 3. Text and Symbols. 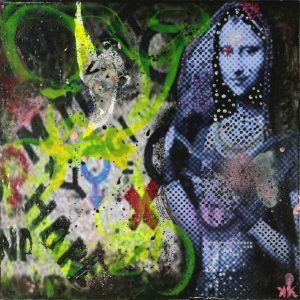 (Hand sanitizers are provided in every section).100 Tactile was conceived by Ceci M W, a conceptual artist based in New York. 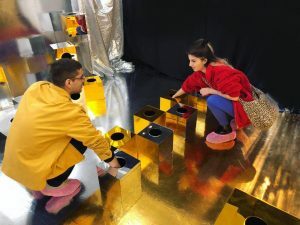 Ceci’s installation work frequently involves physical interactions with the audience in unexpected ways, examining psychological effects, physiological senses, or communication between humans through participation. They’re cuddly. They’re smart. We treat them like part of the family. From lovable companions to loyal protectors, dogs live and work alongside us. They can rescue us from peril, sniff out danger, or provide help to people in need. 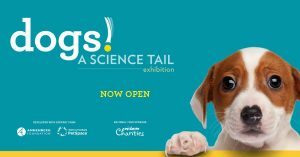 Through engaging and fun hands-on exhibits, visitors can explore the science behind the bond between humans and dogs. Find out how humans and dogs are both wired for social connection, which made it possible for dogs to nuzzle their way into human society and into our hearts. Discover dogs’ amazing senses and grab the chance to see, hear, smell, and act like a dog. ALERT: Please note: Humans only! Service dogs that have been individually trained to work or perform tasks for a guest with a disability are welcome, in accordance with the Americans with Disabilities Act. Pets, comfort animals, emotional support animals, or therapy animals are not allowed, for the safety of the Science Center’s exhibit animals. 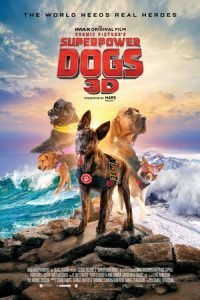 Enhance your California Science Center experience with an immersive IMAX adventure to experience the life-saving superpowers and extraordinary bravery of some of the world’s most amazing dogs. Superpower Dogs 3D takes you on a journey around the globe to meet remarkable dogs who save lives and discover the powerful bond they share with their human partners. Circa is a new collection of luxury apartments unlike anything Downtown Los Angeles has seen before. Designer residences and penthouses with unrivaled views, lavish amenities and a two-acre rooftop park and pool retreat. All in the city’s most enviable address, right across the street from LA LIVE. The developer reserves the right to make modifications in materials, specifications, plans, designs, pricing, scheduling and delivery of homes without prior notice. All dimensions and representations of square footage are approximate and are for reference purposes only. Plans shown in marketing materials are not to scale.